Come and meet author Sister Kathleen Atkinson, of Annunciation Monastery, at one of her book signings. She will be signing copies of her book, "God is Always There. Psalms for Every Moment." March 10, 2013 - Barnes & Noble, Minot, ND - 2 p.m. to 4 p.m. Inspirational reading for your journey through Lent. Also, a lovely addition to an Easter basket! The stories in "God is Always There. Psalms for Every Moment," newly released from Liguori Publications, are as varied as earth itself, set in locations from the prairies of North Dakota to the jungles of Guatemala and from prisons and homeless shelters. They feature real individuals who experience a range of emotions: love, loss, grief, gain, joy, anger, fear, and more. Atkinson collected these stories during years of ministering to others, especially those on the fringes of life. 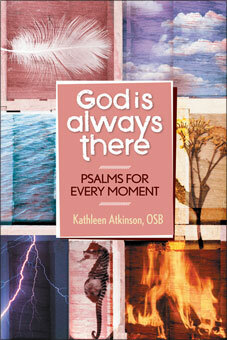 She has matched each reflective story with an appropriate psalm and prayer response, to help readers come to know that God is always there, in every moment.